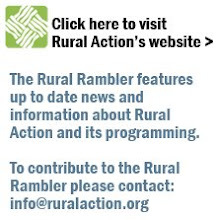 Here at Rural Action we have had another successful year. We have you, our dedicated members to thank for that. As we make merry this holiday season, we would love to have you join us. So please, stop by this Friday and be part of our Holiday Open House, from 4:00 pm until 7:00pm. There will be friends, food and plenty of fun as we celebrate each other and all that we have accomplished together. The Open House is at our Kuhre Center for Rural Renewal, 19627 Walnut Street, Trimble, Ohio 45782. Note: If school is canceled on Friday due to snow, the Open House will also be canceled. Ed Green will work with Rural Appalachian Housing Development on its new rental assistance program. Kristyn Robinson will work with Friends of Lower Muskingum River, Inc. in Marietta.